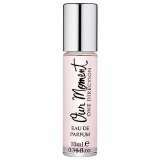 An easy to use intoxicating perfume oil.Made with essential oils that deliver a fresh & sensuous fragrance.Packaged in a convenient roll-on vial.Ideal as a handbag accessory for on-the-go application.Free of paraben sulfate phthalate phosphate & gluten. A rich perfumed moisturizing body cream.Formulated with conditioning ingredients to hydrate & shield body skin.Quickly dissolves into skin to deliver long-lasting comfort.Infused with a sensuous fragrance to enhance the mood.Body skin appears softer smoother fresher & more soothed. Created in 1994, Modigliani is a refreshing, flowery fragrance. This feminine scent contains a blend of florals blended with low notes of powdery wood. It is recommended for daytime wear. Floral, Fresh, Sweet. Designed by Jesus del Pozo in 1992, Duende is described to be a refreshing, aquatic fragrance. This feminine scent contains blend of mandarin melons, bergamot, freesia, and jasmine. It is also accented with musk, oakmoss and vetiver making Duende perfect for daytime use. Hello Kitty Baby perfume was presented in 2008 and it is ideal for small children. It is created of bitter-sweet red berries and fresh green hazelnut in top notes, a heart with strawberries and violet and base notes of wood and musk.